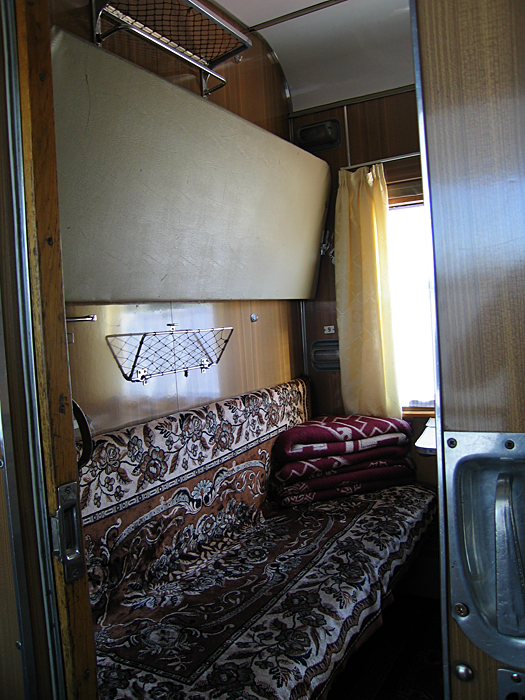 The train from Ulaan Batar, Mongolia to Beijing, China was booked weeks in advance but I had no trouble getting a ticket to Hohhot, China. I enjoyed Beijing during Phase I of my trip but it made more sense to head directly to Hohhot, where I could continue on along the Silk Road and, eventually, to Kyrgyzstan. Its funny, looking back at old planning posts to remember why I went where I did. Although I spent three weeks traveling through Western China to get to Kyrgyzstan, you’ll remember that I considered it “transiting through” on my way to Central Asia. There were no Western border crossing from Mongolia open to foreigners and I figured I could stop at a few historic towns along the way. Being China, it took longer than expected. The train left at 8pm and was much nicer than I expected. 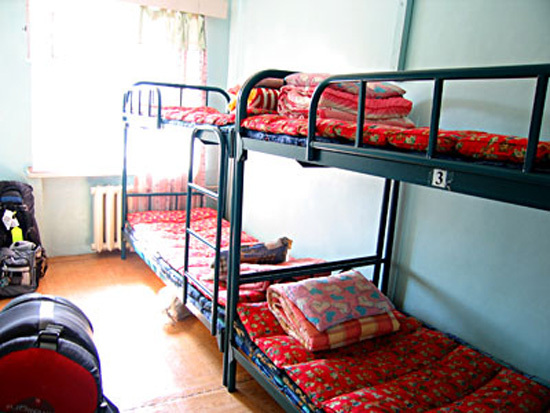 Here’s a smaller picture of the beds made up for sleeping. We arrived at the Chinese border in the morning where the train was lifted (with most passengers still onboard) and reattached to a different gauge of wheels. We didn’t get in to Hohhot until the 10:30pm the following night and were greeted with fireworks. If you didn’t catch it the first time around you can read the whole story here. 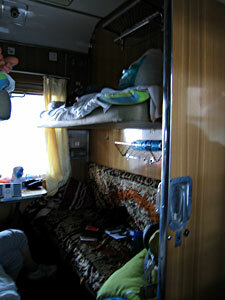 The train fare included my sleeping berth and an odd packet of food. 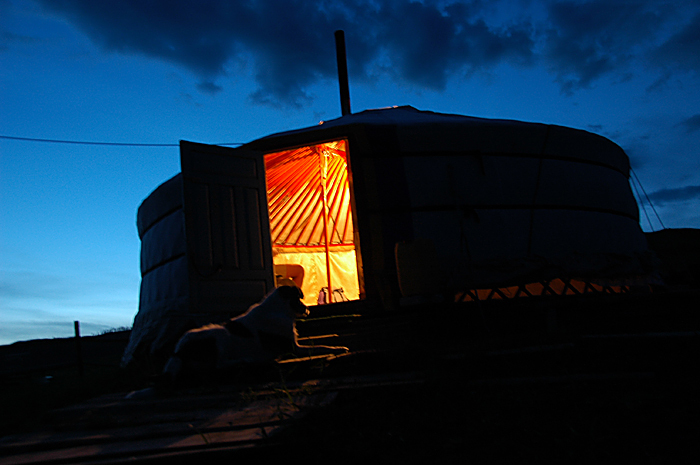 This was my third (and last) time back in Mongolia’s capital and finally time for The Naadam Festival! This is the busiest time of the year in the capital and I had booked this bed months in advance?one of only a handful of times I booked in advance at all during my trips. You can see the gaudy green deel (Mongolian coat/dress) I bought at the black market. Plastic bags are everywhere when you travel (aside from Rwanda where they are banned!) and I find that each country has its own popular styles. You can see the thin green and red and white striped plastic bags typical of Mongolia at the time in the photo above. 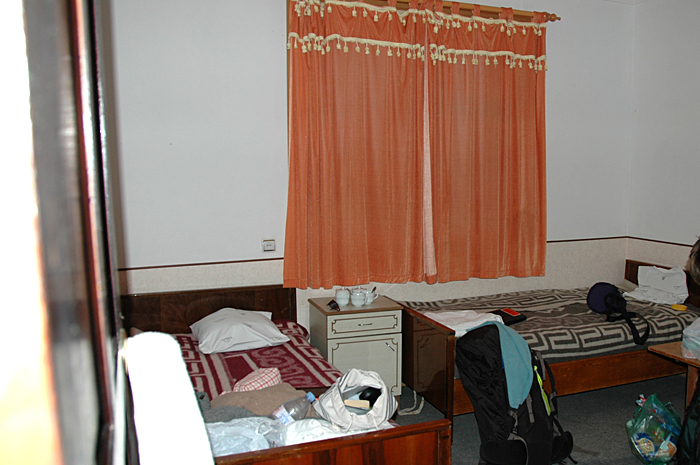 The $5 for my bunk bed included a self-serve breakfast of toast and tea, but given the amount of people packed into every corner of the hostel the loaf of bread supplied vanished before I woke up each morning. It wasn’t too expensive to buy my own food at the grocery around the corner. Even better, by the second time I landed in Ulaan Baatar I’d discovered a French-style bakery with chocolate croissants! 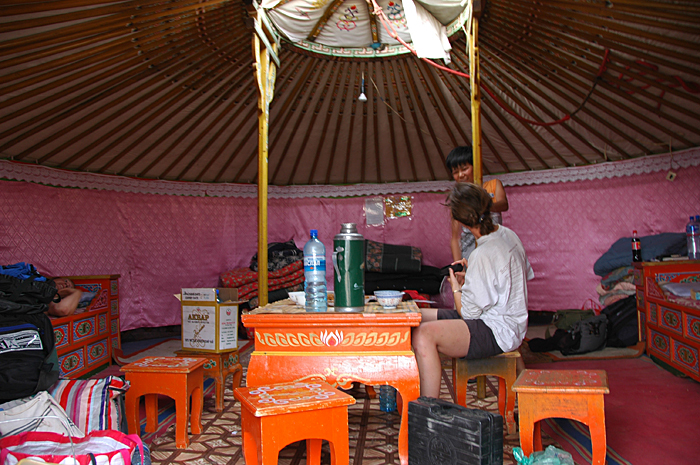 The last night in The Gobi Desert and a really nice family to stay with. The owner’s children were running around play fighting among the rusted out remains of old cars surrounding the ger. She even found a toilet seat and constructed a “Western-style” toilet in the outhouse. It didn’t flush, of course, but its the little gestures that make a difference when you travel. The owner was quite an independent woman and smart too?she made most of the girls try on her old deels to see if they would buy them. Don’t miss the traditional painted beds, intricately painted ceiling poles and beautifully-embroidered fabric covering the hole in the ceiling. Fun fact about gers: you should only walk around them clockwise (like a Buddhist or Hindu temples). These are the type of customs that I learn while traveling and forget that most people don’t know. The price above includes dinner and breakfast. 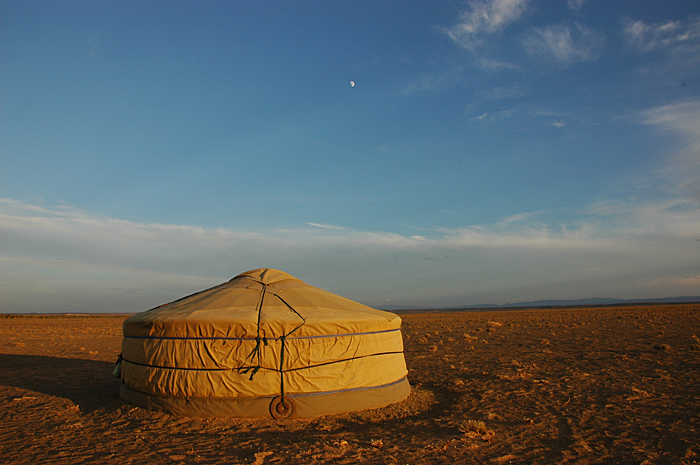 You can read the story about my Gobi Desert trip here or look at all of my photos from Mongolia here in the gallery. Still in the middle of nowhere. My van-mates played frisbee in the desert while I sat behind the ger watching the sun set and drawing in my journal. There was an amazing thunderstorm this night and my driver caught and tormented a poor baby hedgehog. This trip was getting to me, I’m glad I had my Northern Irish friend with me or I might have totally cracked. Its too bad I couldn’t enjoy the beautiful setting. This group of gers was at the base of some sand dunes which we rode camels on. The camels don’t really go on the sand dunes which is a shame, because walking on the sand dunes is much harder than walking to the sand dunes. Sand dunes are also the most difficult surface I’ve ever cartwheeled on. On the way here we stopped at a glacier (in the desert!) and the van broke down again so we didn’t arrive until 9:30pm. 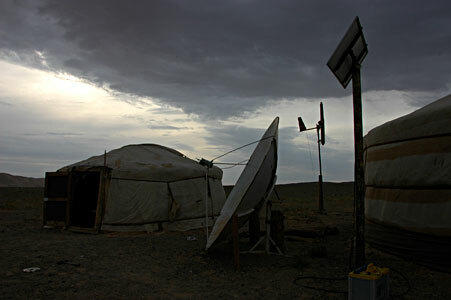 This ger was harnessing solar and wind power, which you can see in this shot of the exterior. This was the first stop on any of my Mongolian trips that we’d run into another van of tourists so it was a bit odd to be in the middle of nowhere but not alone at all. 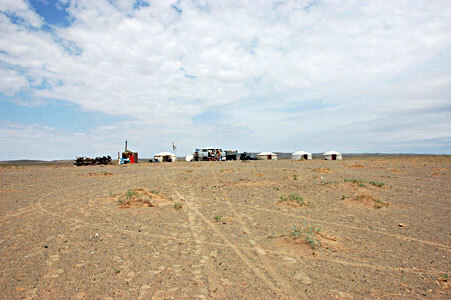 Dalanzadgad?the big city in the Gobi! This is the only time during our 8-day trip that we were able to take a shower (at the public bath house for $0.67). The shower felt great but walking back to the house through the dusty streets left me almost as dirty as before. Although it was an actual town with concrete buildings many of the private homes were merely a fenced areas with a ger in the middle, or sometimes a small concrete house with an extra ger beside it. We didn’t have much time to explore the town after a 3.5 hour breakdown in the desert delayed our arrival until the evening. I was the only American on this trip (my other van-mates were Northern Irish and Dutch) so I had to celebrate Independence Day alone, like I usually do on the road. The price included breakfast and dinner cooked by the family/owners. Luckily, the town had a few shops and I was able to stock up on chocolate (which promptly melted?it is the desert, afterall). 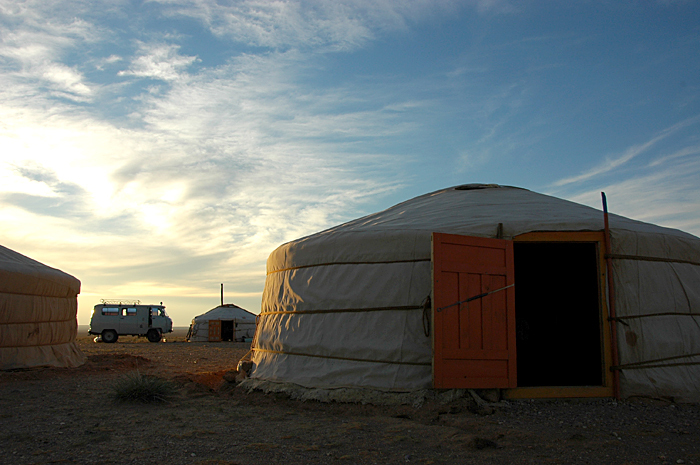 Night two on my Gobi Desert trip was a stop with a family that felt like the middle of nowhere and going to the bathroom in the middle of the night was pretty scary if you didn’t keep your bearings and head back in the right direction in the pitch black night. The price included breakfast and dinner cooked by the family/owners. We made the driver’s son eat most of the dinner, which was a sort of breaded pocket of purple organ meat. I really tired to eat it out of hospitality but even ketchup didn’t help disguise the smell. Finding a ger full of drying meat covered in maggots didn’t help either! Breakfast was instant noodles, which is what I had brought for lunch. I do love ramen! 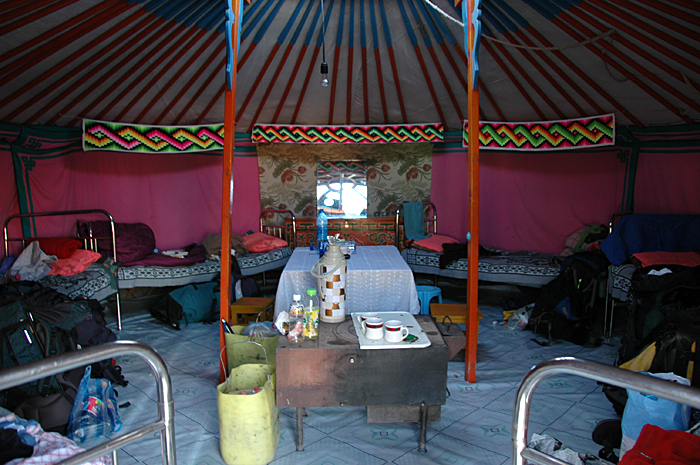 This was our first stop on my second van trip around Mongolia with five strangers?this time through the Gobi Desert (skip ahead and read the entire trip report here if you like). After 9 hours driving from Ulaan Bataar we almost didn’t make it to this place. Our driver, despite being “from the desert”, got incredibly lost on the way and tried to get us to stop at a random ger where he asked for directions. Two of us insisted we find this place because we didn’t want to displace an entire family from their ger. We also figured that if we didn’t find the correct starting place for tomorrow’s long ride we’d be spending more than 9 hours in the van for the second straight day. A few of the others wanted to stay in the random ger instead of continuing to drive. This would be the first of many clashes between the group over the rest of the 8-day trip. Although this hotel was basically in the middle of nowhere its named for the ruined ‘castle’ nearby. We arrived too late to do much exploring but did enjoy a nice sunset. Despite the overpriced cost we were responsible for cooking our own food brought from the capital on the wood floor of the main room. I made this hostel my home base in-between trips to the countryside. 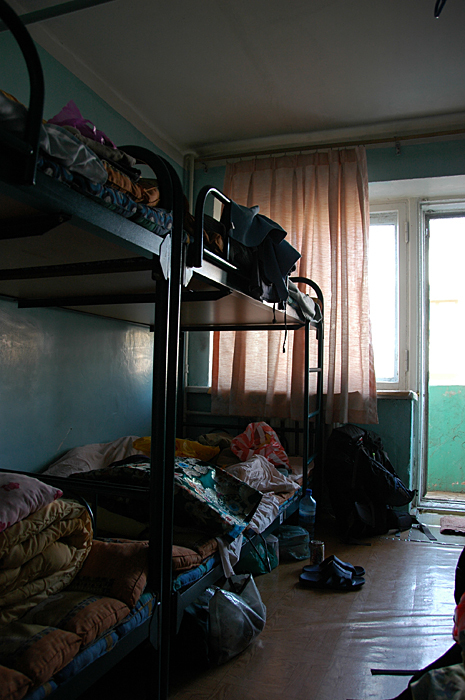 I had a number of different rooms, this being a typical dorm room you’ll see in Mongolia. The cost included a breakfast which was basically just tea and toast in the kitchen. If you got up too late it would all be eaten and the butter melted so I didn’t get too much to eat. I did stop by a local grocery store for supplies and made dinner a few times when I wasn’t eating at the English or Irish pub. Before you judge me did I mention I had to eat organ meat in Mongolia? My fish and chips was well-earned. This was the first town we’d seen in a while, the second monastery of the 10-day trip and it was a bit of a detour off of the paved road we’d been driving on. 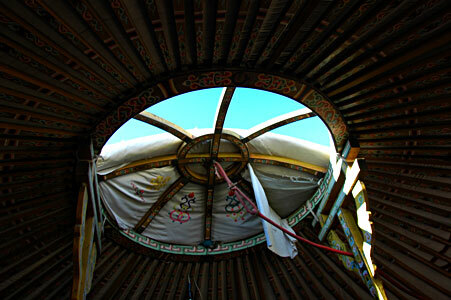 Because of its remote location nestled between hills it was one of the few monasteries in Mongolia spared by invaders. The owner of this ger, who bore a striking resemblance to Mr. Miyagi, lived in a concrete house and even had a mailbox. His dog watched over the ger, which stood in his side yard, throughout the night. 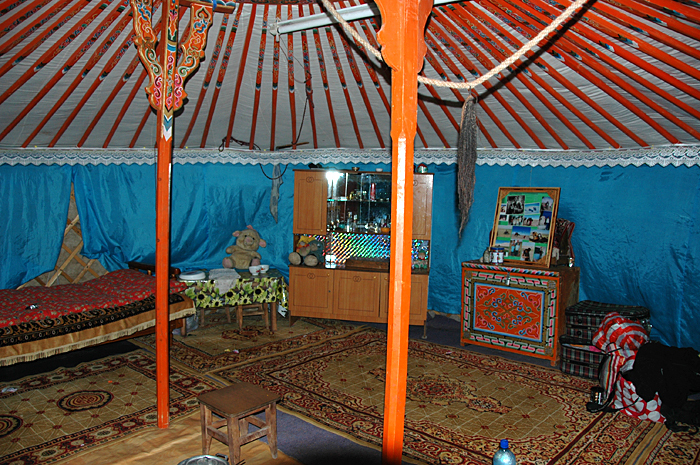 This was also the first town where we met a Peace Corps volunteer, although I had seen countless numbers of them in the hostels and pubs in Ulaan Bataar. She showed us her accommodations?a simple one-room concrete bunker. The price included dinner and breakfast and cooked by the family/owners.